One of the most famous fossils of the human family is Lucy. If you’ve ever had the chance to see her (or a reconstruction) you’ll be struck by one thing: She’s tiny. Human height has clearly changed dramatically over the course of our evolution. 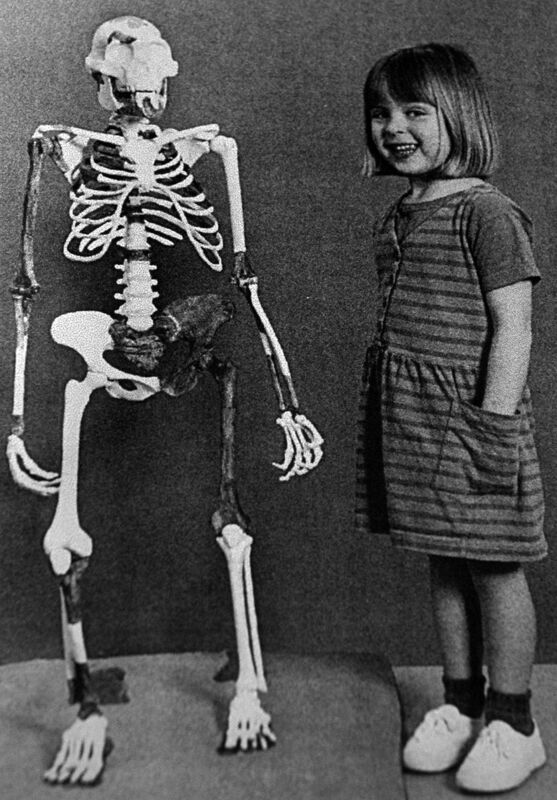 Lucy with a human five year old. Despite their size similarity, Lucy was fully grown. But that doesn’t mean we’re exactly the pinnacle of human height evolution either. It turns out our stature actually peaked 100,000 – 200,000 years ago. The median height then (across both sexes) was 10 cm higher than present hunter-gatherers. And still 4 cm higher than the average American today. Why have we shrunk? And will we ever return to the dizzying median height of 1.74 metres tall? Let’s find out. 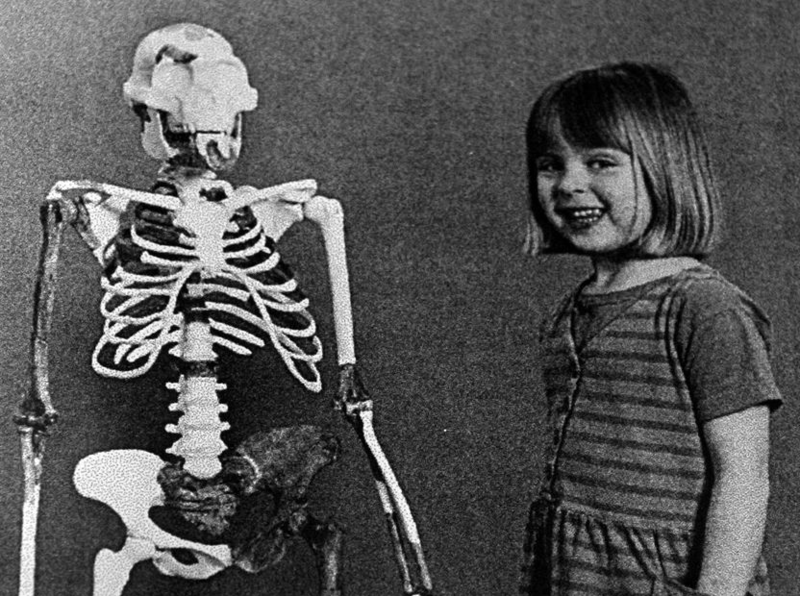 Lucy was an adult female Australopithecus that lived more than 3 million years ago. Despite being fully grown, she measures up at only 1.1 metres tall (or 3 foot 6). She was small for her species, but taking their average height (1.28 metres) doesn’t change much. These early family members were still very small. And it’s not just Lucy’s species either. Every member of our lineage was around this size for the first five million years of our evolution. But as we plot the height of the hundreds of hominin fossils we’ve found, a change begins to emerge. With the appearance of our group – Homo – evolved that we start seeing a significant growth. This started around 2.5 million years ago and reached its peak by some time within the last million years. Now, that little chronology involves a fair few dates and measurements that can make it tricky to remember. So instead, here’s that info in a handy timeline form. Also pictured is body mass, because I’m nothing if not thorough. As the chart shows, our family’s weight changed in a similar pattern, although it peaked with the Neanderthals. 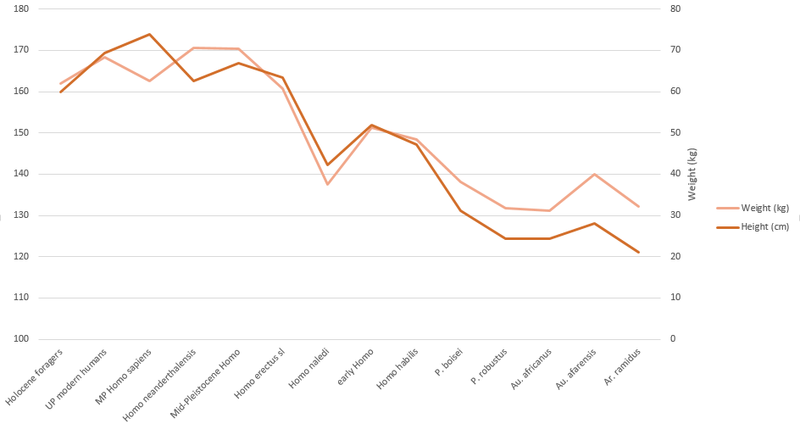 Who, interestingly enough, had a slight decrease in height as per the chart above. They were short but heavy. Interesting asides aside, there is a general pattern here. We started fairly consistently small, consistently grew, then became increasingly varied (with height and weight not always aligning) and eventually started to get shorter. To understand why our lineage became small, you have to remember that humans are still animals. As such, we’re influenced by (and have to adapt to) similar forces. One of the big ones is temperature. See, the further north you travel the colder it gets. As such, a group evolves to deal with this. A common adaptation is greater mass. It helps with insulation and other stuff. This is Bergmann’s rule. However, at the same time, increasing mass can also increase surface area, which radiates heat faster. This can make getting a larger mass counterproductive. As such, species also began to shrink their limbs and trunk. This is Allen’s rule. This creates a tradeoff. Getting bigger helps to a point, after which Allen’s rule comes into play and size must decrease. This switch between the rules happens for different points in different species. For humans, this tradeoff happens at roughly the same latitude of Europe. At least, Europe is where this switchover happens currently. But about 50,000 the world was in the depths of the ice age. The colder climate would have pushed this switchover further south, forcing human height to become shorter in more populations. By coincidence, this is also the time humans began to shrink. Oh wait, that’s not coincidence. That’s science. In short, we got short because humans are animals that have to deal with the same problems as other animals. Sometimes that means we have to evolve smaller, not bigger. Grabowski, M., Hatala, K.G., Jungers, W.L. and Richmond, B.G., 2015. Body mass estimates of hominin fossils and the evolution of human body size. Journal of Human Evolution, 85, pp.75-93. McHenry, H.M., 1994. Behavioral ecological implications of early hominid body size. Journal of Human Evolution, 27(1-3), pp.77-87. Neufuss, J., Robbins, M.M., Baeumer, J., Humle, T. and Kivell, T.L., 2017. 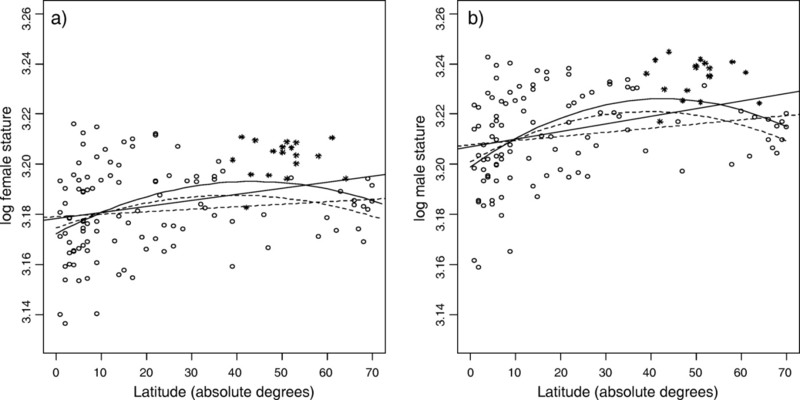 Comparison of hand use and forelimb posture during vertical climbing in mountain gorillas (Gorilla beringei beringei) and chimpanzees (Pan troglodytes). American journal of physical anthropology. Will, M., Pablos, A. and Stock, J.T., 2017. Long-term patterns of body mass and stature evolution within the hominin lineage. Royal Society Open Science, 4(11), p.171339. Previous post: Why is our face the flattest in the human family?